Understanding the evolution of structure, from the primordial fluctuations in the CMB to the distribution and morphologies of galaxies in the local Universe, and the physical processes and efficiencies of star formation at all cosmological epochs are some of the major goals of modern astrophysics. Millimeter-wavelength observations offer a unique opportunity to probe the coldest, densest and most-obscured environments in the Universe which are also often the sites of the earliest stages of structure formation. 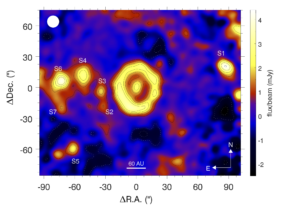 The unprecedented capabilities of the LMT provide excellent sensitivity to point-sources and low-surface brightness emission, due primarily to ~2000 m2 of collecting area, the high surface-accuracy of the telescope and the quality of the Sierra Negra site for astronomical observations at millimeter wavelengths. The LMT is complemented by a suite of state-of-the-art continuum and heterodyne instruments that enable the evolution of structure to be traced on a wide-variety of physical scales and throughout the entire history of the Universe. The list of LMT published results can be found here. Detailed discussions on the scientific potential of the LMT are found in the chapters of the LMT Book.